I could not be happier for Terry Flanagan. His historic acquisition of the WBO World Lightweight title as the first Englishman to reign in this division was another tremendous boost for British boxing, which currently is on so much of a high. How many world champions does the UK and Ireland have now? I think it is ten including three interim title holders, but I seem to have lost count! And there may be a fistful more to come before the years is out. Ok, Flanagan’s win wasn’t achieved in ideal circumstances, with the unfortunate shoulder injury forcing the stoppage of Jose Zepeda after just two rounds. But Flanagan can’t be blamed for that – it was one of those things that can happen in boxing, and should not detract from the triumph he has worked so hard to realise. My personal view is that he would have gone on to win the fight anyway as he was settling nicely into his rhythm and already thwarting the big guns that Zepeda was attempting to fire. I have to admit, that when I made the fight there was some reluctance on the part of Flanagan’s camp to take it because of the unbeaten Zepeda’s big-hitting reputation. We discussed other options but I was adamant this was the right fight and I’m delighted the gamble paid off. It was a result, whatever the situation, that is a real feel-good story. Local boy makes good. Very good. Flanagan’s home in Ancoats is just around the corner from the Manchester Velodrome. His support was tremendous and it just shows how important home backing is. And as for Flanagan, well, as the great Arthur Daley used to say, the world is his lobster. There are some terrific matches to be made. Not least, of course, a return with Zepeda that the American richly deserves. But that dislocated shoulder, the bone clearly sticking out of its socket, was really nasty and will need surgery. He certainly won’t be back in the ring again this year and it might well take him 18 month to be fighting fit again. I think Flanagan deserved the title because it wasn’t, say, an accidental clash of heads, but a genuine injury to Zepeda that was self-inflicted when he threw a left hook, missed and there was a clash of arms. He wasn’t the first fighter to lose in this manner. Vitali Klitschko pulled out with a shoulder injury against Chris Byrd, as did Sonny Liston against Muhammad Ali in their first fight. 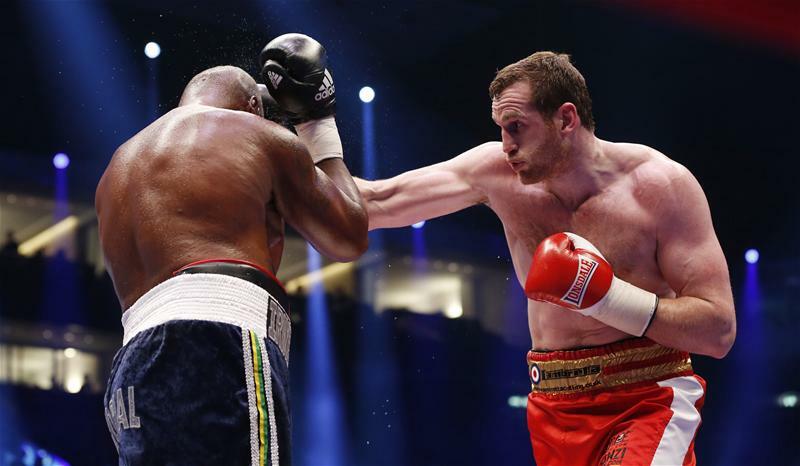 Britain’s Carl Thompson also suffered a similar fate in the 11th round in a WBO cruiserweight title fight ten years ago against Ralf Rocchigiani. Coincidentally that was also in Manchester. I remember trying to pull Danny Williams out when he dislocated a shoulder, but he insisted on continuing and went on to knock out Mark Potter. It was one of the most dramatic fights you could ever hope to see. It’s an awful injury for a fighter, especially in a world title fight, rather like a footballer breaking his leg in a Cup Final. Meantime, there are a couple of tasty domestic matches we can make for the supercharged Turbo. Like Derry Matthews, who holds the WBA interim title and Liam Walsh, who again demonstrated on this bill what a thrilling prospect he is. Or there could be a re-match with Irishman Stephen Ormond, which I know Flanagan would relish. He’d also like a showdown with his Mancunian mate Anthony Crolla and if Crolla comes through his WBA challenge against Darleys Perez this Saturday, I’ll be more than happy to make him an offer. We are looking to build on Terry’s success and make Manchester the hotbed of British boxing again, just like the Ricky Hatton days. When boxing comes up with a story like Flanagan it makes the heart feel good. What’s more, it shows that you don’t have to win an Olympic medal or even go to an Olympic Games to make it as a top pro. 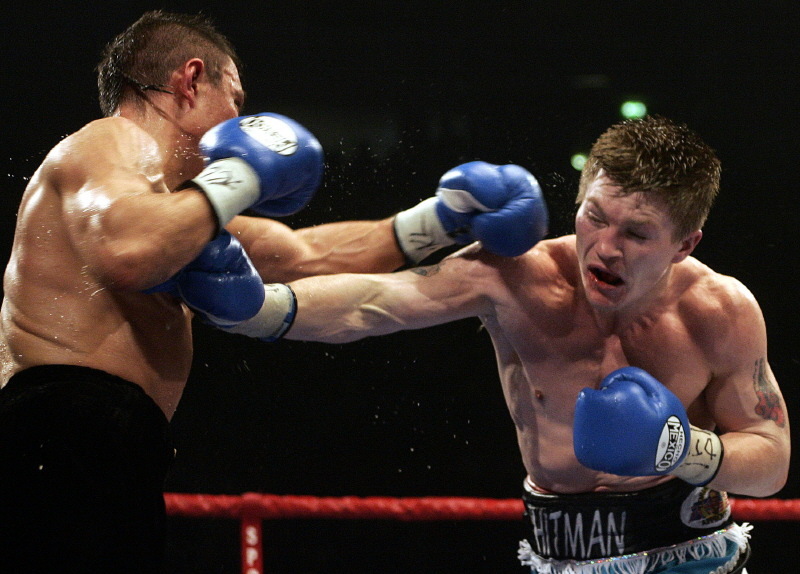 Hatton, who Flanagan has always idolised, proves that. In fact, Flanagan is the first Mancunian since The Hitman himself to win a world title. Frank Bruno, Nigel Benn, Joe Calzaghe and Naseem Hamed are other examples of non-Olympians who became world champions. In all, I thought it was an excellent night of boxing, with Walsh, Jack Catterall and Paul Butler (so good to see him getting confidently back on track after his world title loss) coming through with convincing crowd-pleasing wins. But I have to say, for me, the one disappointment in the ring was the performance of referee Marcus McDonnell in Catterall’s contest against an Argentine, who was an ugly opponent in every sense of the word – a real awkward cuss who fought more like a crab than a wild bull of the Pampas! I thought the two points deducted from Catterall for what seemed minor infringements, were at best debatable, as was one of those against the Argentine. In my opinion McDonnell, was over-fussy and it could have been unsettling for Catterall at this stage of his burgeoning career. 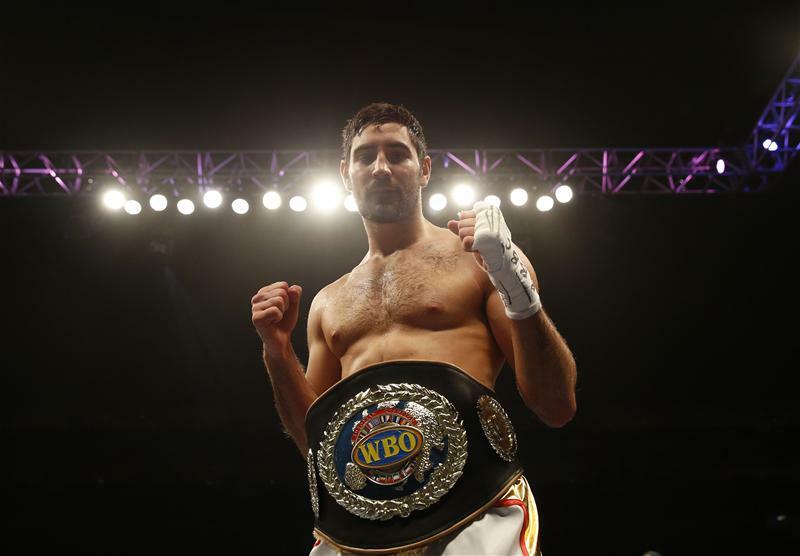 This was the first defence of the WBO Inter-Continental light-welterweight belt the won from another awkward Argy southpaw, Cesar David Inalef, in March. He is now unbeaten in 12 fights and also holds the WBO European crown. He looks good, carries himself well and does the business. The opponent he had could not have been worse for him but what I like about him is that he never gets flustered and, even though he is only a kid, he finds a way to win. It was also another good night for BoxNation, who have beamed great fight nights, all featuring thrills, spills and some highly controversial incidents on three successive Saturdays, from California, Dublin and now Manchester. I am pleased that the punters seem to have appreciated yet again a very professional presentation by our team. What BoxNation has done in the last four years is to enable a lot of British fighters to get shots at world titles – and win some that they would never have done before. People tell us it is a fan-friendly channel and we have great plans for the future – so watch this space. Tonight, BoxNation exclusively screens David Price’s attempt to become European heavyweight champion against German Erkan Teper in Baden-Württemberg. I have to say, I think this is the big Liverpudlian’s last chance to get back into the big time, and Teper is no slouch, especially on home turf. At 28 he is three years younger than Price, and also carries a big dig. His two previous British opponents, Martin Rogan and Michael Sprott, were each summarily despatched in a round. Price has a great jab as well as his formidable punching power, but that chin is so vulnerable. If it wasn’t for the whacks he took on it in those two fights with Tony Thompson then it might well have been him fighting Vladimir Klitschko in October and not Tyson Fury. Who knows? He is now resurrecting his career with German promoters Sauerland but worryingly has been somewhat injury-prone of late. Being a big puncher is not what boxing is all about, as I think we would have seen had the Flanagan-Zepeda fight progressed further. If it was, we wouldn’t need judges. But this is Pricey’s big opportunity to produce something special against Teper, who is unbeaten in 14 fights, and show more resolve than he did against Thompson and also when he was defeated in the Olympic semi-final in Beijing by the Italian copper Roberto Cammarelle, who Anthony Joshua controversially outscored to win his Olympic gold medal in London. There are a lot of ingredients that make up a fighter and one of them is not to show self-doubt. Swings and roundabouts. 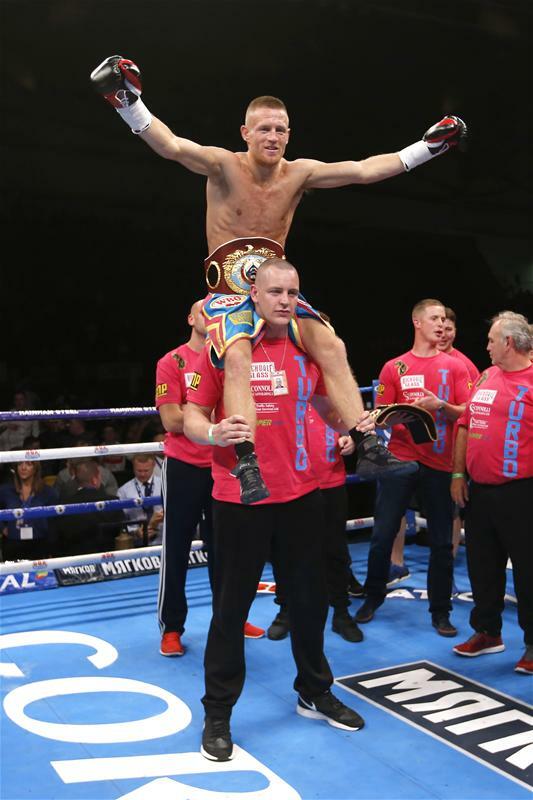 After the euphoria of Terry Flanagan becoming our latest world champion we were hit with the news that Fedor Chudinov, the Russian WBA super-middleweight champion has had to pull out from defending against Frank Buglioni on 24 July because of a broken nose sustained in sparring. It is a real sickener but you come to weather these sort of setbacks in boxing. I feel gutted for Frank, who has been training so hard with Steve Collins in Dublin, and Chudinov too, of course. I gave Frank a decent chance of winning this one, which now will be re-scheduled for September. This sort of situation is a promoter’s nightmare. Meantime, as we say in the blow business, the Wembley show will go on with a new opponent for Buglioni to keep him on his toes while he is waiting for Chudinov to recover, and featuring some of our great crop of rising stars, including Mitchell Smith, Lewis Pettitt, Ovill McKenzie, Jamie Cox and Gary Corcoran all in championship fights. I wish Carl Froch well in his retirement. He has made a sensible decision after great career in which he showed a lot of skill and heart. He has been a great world champion though on a personal note I am disappointed he never fought Joe Calzaghe. I offered him the fight twice but he declined. I may be biased, but I believe Calzaghe would have beaten him. Froch never fought opponents quite as good as those Joe faced in his even more illustrious career. I just hope Froch now follows Calzaghe’s example and stays retired. The one thing they have in common is that both have given great service to the sport. True warriors.